The top row allows you to “record” chords into the computer, and “recall” them back while the rhythm unit is playing, or get the computer to automatically play chords and pedals for “one-fingered” chord playing (you press “C” on the lower-manual to play the C chord, and optionally a natural pedal to make it a major 7th chord, or a flat or sharp pedal to make it a minor chord), or get it to just automatically play pedals for full-fingered chords (it plays the suitable pedal for the chords that you play on the lower-manual). The (white) “memory” button keeps playing a chord that you play until you play another one (you can take your hand off the manual, and it acts like the keys are still held down—some Hammond organs had a “key click” feature that physically held the keys down for you), though this isn't like the sustain pedal on a piano, as there's no way to release the keys being held. And the (green) “technichord” button makes the computer add chords to the upper-manual, based on what you play on the lower manual (this is a bit problematic, though, as the manuals were each only eight-note polyphonic, playing only the upper eight keys held down on the manuals). 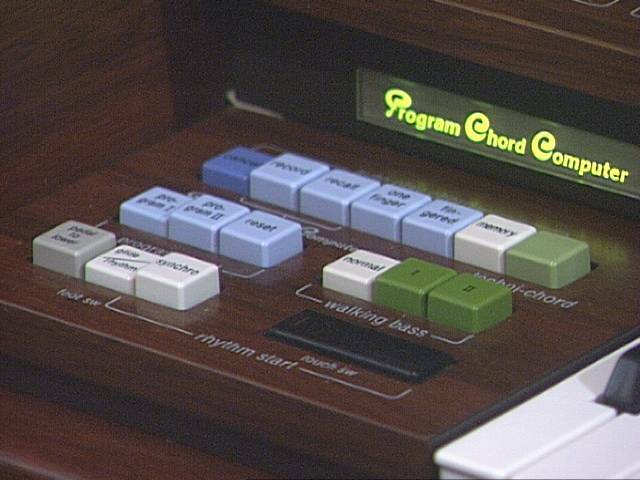 The blue row of buttons in the middle controls which memory bank is used for automatic chord playing, and a reset button to go back to the start of the program. The adjacent white and green buttons control how it plays automatic bass lines with the automatic rhythm unit (three different patterns) when you're using any of the above row's automatic programmed or manually fingered chord features. The lower row can couple the pedal board to the lower-manual (killing the pedal board at the same time, and extending the pedal range to the full lower manual—allowing you to get an octave lower, as if you were playing 32″ pipes; and extending all the way up the keyboard, although it doesn't sound very good another octave up). A switch determines whether the foot switch (left of the expression pedal) detunes most of the tone generators (Hawaiian guitar style), or if it starts/stops the rhythm unit. And there's a syncho-start button to make the rhythm unit start up when you press a note on the pedal board or lower manual. Next to that is a large button to start and stop the rhythm unit.